UPDATE: I'm closing out my year of cartooning for McSweeney's. 17 columns, 40 pages of comics. On top of dailies. And full-time work. I'm exhausted. This is everything I've learned about why I'm an old maid, in real time. Mostly because it's hard to lie to yourself in comics. Thank you for reading along. I gave it my all. I needed to do it. It was not without costs. That said - I've been invited to continue the column. Should I keep writing "old maid"? 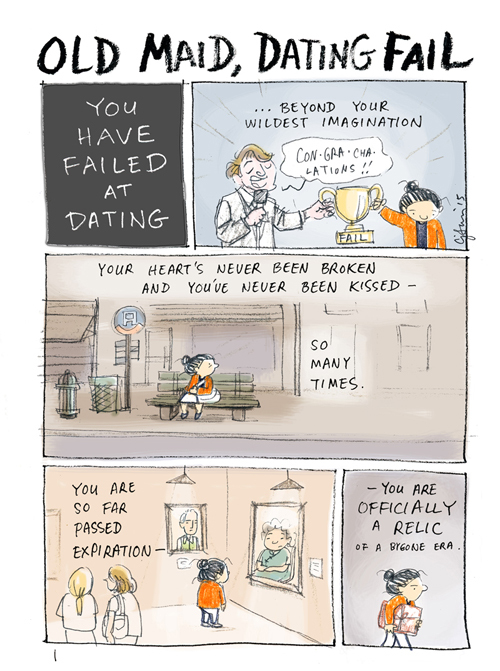 OLD MAID, DATING FAIL is the final installment of the contest year. Page 1 of 4. You can read the whole thing here. Oh Yes! Please do continue--I love your column there! Yes! I would love to see you (through your comics) get past your low self esteem. I'm of the opinion that what makes somebody beautiful is their confidence. Even if you don't continue I wish all the best. Congratulations!! I love the series. I hope you do continue! Con-gra-cha-lations! Yes, please continue the column! Love your work. Yes, so long as it helps keep you doing the comics work you should so obviously be doing. As a sixty-two year old male "Connie" (as far as finding love is concerned), I can really relate to and enjoy your work. I haven't totally given up hope, and hope you don't either. As to continuing "Old Maid", I hope you do, but if it is really beating you up physically and emotionally, walk away. The world will go on, and we still have the dailies. Only you can decide how much work you are comfortable doing. So many people enjoy what you are producing, but you also need time to be happy and time to relax. Please do what's best for you! Continue! Your art is wonderfully honest & refreshing and your insights are so validating for me (& obviously others). You are a needed voice. I’ve thoroughly enjoyed reading your column over the last year. Your honesty and introspection are quite refreshing. Even while recognizing the strength you must have and the toll it must take on you to create it, I selfishly hope you do continue to make it. Thank you for sharing it with us. Yes! I love your column! Do what you need to do for you, Connie. We love your work but I understand that growth implies change, and change implies growth. Love reading the colum! Exhaustion is not a good thing and sometimes you need to take a break or a vacation. Have you thought about cutting the dailies to 2 to 3 times a week? Maybe that's a way to do both? This is my life sans the talent and the terrific insight. I love your work and the words And needed to leave a message to thank you! Thanks for the heartache but also the lovely, quiet affirmation. Whichever way you decide to take this I'm really really glad to be/ have been a reader. Bests! Absolutely! Your insights and your art are brilliant! I love your work so much! Whether you continue the column for mcsweeny's or not- thank you for it!